Phosphate, while required in miniscule amounts by living organisms for proper functioning, can indirectly negatively impact the overall appearance of an aquarium system if it is allowed to exist at a concentration measurable by most aquarium test kits (e.g. >0.05 ppm); in order for this impact to occur, other undesirable substances must be present in varying concentrations, however these substances are rarely limiting in the typical marine aquarium. Because of this, elevated phosphate concentrations, whether sporadic or chronic, should be combated. Phosphāt-E enables a quick solution to elevated phosphate concentrations by binding the reactive (“free”) form of the molecule and making it unavailable for biological uptake. The resultant inert phosphate compound (a particulate) may then be permanently removed from the system via mechanical filtration and/or protein skimming. This method of treatment may be used as needed and/or on a continual basis to maintain an immeasurable phosphate concentration in a marine aquarium. While Phosphāt-E provides a workable solution to potential phosphate-related problems, it should not be seen as an alternative to proper and sensible aquarium husbandry. Aquaria with extremely-low to immeasurable reactive phosphate often appear more pristine than those in which phosphate is allowed to persist in an elevated concentration. Feeding aquarium inhabitants sensibly, limiting the use of organic-based supplements and additives, use of a high-quality synthetic aquarium salt blend, and performing water changes/replacing evaporation with purified water are all important aspects of phosphate control. Additional means of limiting phosphate are maintaining a culture of macroalgae in the system to naturally deplete phosphate and other substances, and/or the use of an effective and well-maintained protein skimmer. Advanced: Determine phosphate concentration in aquarium prior to first use by testing with an accurate test kit. 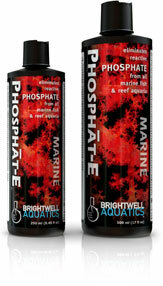 Each ml of Brightwell Aquatics Phosphāt-E will eliminate 1 ppm of reactive (available) phosphate in 4 US-gallons (15.142 L) of water. The result is an inert particulate that is permanently removed from the aquarium via mechanical filtration and protein skimming. To maximize the rate of phosphate removal, Phosphāt-E should be added to the aquarium near the intake of a mechanical filter or protein skimmer. Doing so will enable the inert particulate phosphate compound to be effectively removed from the aquarium. Particulate material not removed by filtration will remain inert and the bound phosphate non-reactive indefinitely under normal aquarium conditions. The maximum dosage should not exceed 1 ml per 4 US-gallons (15.142 L) daily, as too rapid a decrease in the concentration of phosphate may irritate sensitive corals, particularly if the phosphate concentration has existed at a relatively-high level for an extended period of time (e.g. 3 – 6 weeks). The concentration of available phosphate in marine aquaria should not be allowed to exceed 0.05 ppm for any lengthy period of time; available phosphate in the presence of other substances can indirectly negatively impact the appearance of an otherwise beautiful marine aquarium. If corals or other invertebrates appear to react negatively to the addition of the product, it may be an indication that reactive phosphate is being removed too aggressively; decrease dosage by 50% and continue treatment until phosphate concentration appears to be immeasurable.